Let’s Talk is a platform created with an aim to give youth’s their “right to be heard”, politicians from different constituencies offer an opportunity to listen to the voices of young citizens. Since initiation Let’s Talk has become a burning event among the young minds; no other parties in the political history of Bangladesh has ever made the first move for such event where the citizen and politician sat face to face for an open dialogue. Awami League led government parliamentarians has came up and want to listen to the voice of people for bringing positive changes in Bangladesh. After carrying out 11 successful Let’s Talk all around Bangladesh mostly in the major cities this time Sajeeb Wazed Joy a promising young politician again heard the voice of youth in Dhaka. This episode took place at The Hotel Ruposhi Bangla on 28th December, 2013 where students from different reputed universities and organizations came to talk and share their views on politics, national development, policy etc. In the commencing speech Sajeeb Wazed Joy appreciated the spirit of youth in Bangladesh; he praised the fact that youth are very conscious and well aware about politics in compare to other country’s youth. Joy also shared his early school life in India and some memorable part of his student life with the interested crowd. Eager participants wanted to know about his early life, career and educational background and Joy answered all the questions with delight. The participants were asked in which phase of education sector they think have progressed more; different remarks came out from the participants. They think much progress has happened in the core education system but higher education should be more enriched. Some appreciated the online admission system; some suggested that uniform education system should be implemented. In response to the comments Sajeeb Wazed Joy said that it is difficult to introduce uniform education system rather we are trying to implement a core curriculum which every medium will use. He also emphasized on the fact that doesn’t matter which language we are using as a medium of learning but the content of the curriculum is way more important for a proper uniform education system. Students and future leaders also brought issues like creative and general education system, withholding punishment from primary education level, distribution of power into remote peripheries of Bangladesh, solar energy, Rampal project, young innovators lack scope and resources for research and development, tourism, election 2014, 3G access etc. After finishing the first session participant were given a simple form for filling up provided by CRI team where they had answered two questions, 1. What government has achieved so far? & 2. What more could be done? Participants answered and suggested their views over different sectors as well as government’s achievements and flaws. In the meantime present crowd saw few presentations prepared by CRI team over various national sectoral developments. Along with this few students from BUET was given the opportunity to show their inventions and talk directly with the son of current prime ministers. Students emphasized more on science and technology, internet usage and cost reduction, creating scope for research and development etc. Among the participants few raised the issue that research equipments of mechatronics are not available and expensive due to tax, they also addressed some obstacles which engineering students face during their new inventions. Sajeeb Wazed Joy answered all their questions and assured that he would look after this matter since he came from IT discipline. Students proposed so many ideas which can be implemented in national development projects. Another concern among the participants was the upcoming election; they asked how fair it to set an election without opposition is? Sajeeb Wazed Joy answered the question very logically, h said that government is just maintaining constitutional rule, and prime minister had tried hard to sit with the opposition but they rejected every time, so democratic journey cannot be stopped. He also added that for restoring healthy environment in politics it is essential for the opposition to take part. At the end of the program Mr. Joy asked the participants about the challenges the country is facing. Most of them pinned on the cause of political distress. Mr. Joy explained the point of differences with other major parties. He said that Awami League will always be a supporter of good practices of democracy. Mr. Sajeeb Wazed Joy stated that His party in the power is working really hard to develop the country to its best. Such vision is so vast that it needs a continuation. He assured that his party would always be sincere towards progression of Bangladesh at any cost. 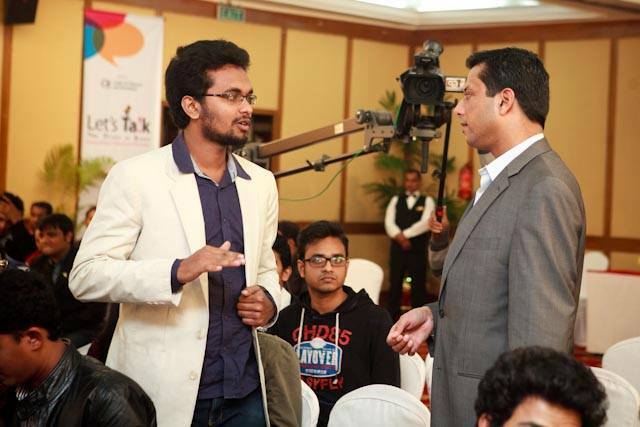 With all these suggestions, questions, answers, recommendations the event came to its last minute, participants were eager to talk more with Sajeeb Wazed Joy; they were given the scope to take group photographs with this prominent political figure. At the end participants attended the evening snacks time at Hotel Ruposhi Bangla.